The amount of space you get to catch the eye of a student or alum is decreasing by the minute. Maybe they used to look at the whole viewbook, or watch that promotional DVD. And remember when you weren’t just another email in the inbox? Now, think about this… what impression can you make with your 40 pixel x 40 pixel avatar? We were recently asked if there was a best practice in avatars for Twitter. Here’s one simple suggestion: stand out. We’ll talk about this and a lot more in Wednesday’s Twitter for Higher Ed webinar. It’s only $99, and you’ll get valuable information on how these schools and more are using Twitter. 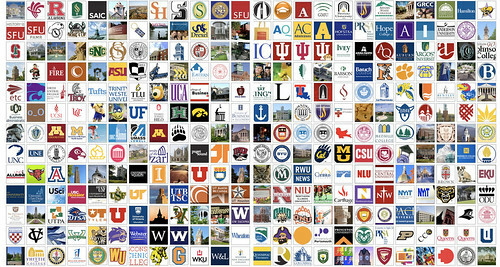 We’re tracking nearly 700 twitter accounts from Admissions, Alumni, Athletics, PR/News, colleges and departments, and more. There’s something for everyone. Are you ready to Ignite the Fuego? Contact us today. Welcome to new and returning clients: Abilene Christian University & University of Massachusetts – Amherst! Seriously hoping @uwgb isn’t on display in that graphic, because I can’t find it. Read: it aint standing out. I had no problem finding @UFlorida.